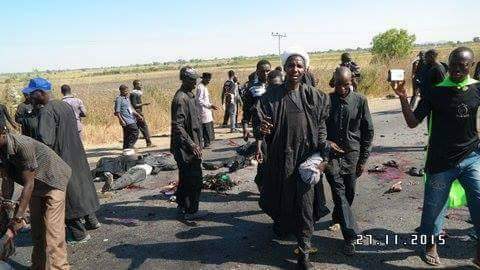 JNN 28 Nov 2015 KANO: At least 21 people were killed and dozens wounded when a male suicide bomber hit a procession of Shia Muslims in Nigeria’s Kano state as they walked to the city of Zaria to pay homage to their founder in the country, security sources and a Shia leader said. Muhammad Turi said that 21 people had been killed and many more wounded. However, police said there were casualties but they could not confirm a figure. The blast went off at around 2 pm local time near the village of Dakozoye outside the town of Garum Mallam, south of Nigeria’s second city Kano. “It was in a bush area, on a farmland along the highway, our concern is to make everywhere safe. The bomb was made of high calibre explosive,” police commissioner Muhammad Musa Katsina said. “We lost 21 people and several others have been injured,” Muhammad Turi from the Islamic Movement of Nigeria (IMN) said. The procession – an annual event lasting seven days – continued after the blast. “We are not surprised that we’ve been attacked because this is the situation all over the country. This will not deter us from our religious observance,” said Mr Turi. The procession travels from Kano to Zaria in neighbouring Kaduna state, where the IMN, the country’s biggest Shia organisation, has its headquarters. Suspected Terrorist group is Boko Haram, which frequently uses suicide bombers to hit soft targets like places of worship, markets and bus stations. Since losing most of the territory it controlled this year, it has returned to guerilla tactics and pledged allegiance to the Wahabi Terrorist Organisation Islamic State (IS) group, primarily based in Syria and Iraq. Last week, two female suicide bombers hit a mobile phone market in Kano, killing at least 14 people and wounding more than 100 others. Boko Haram has been trying to establish an Islamist state adhering to strict Wahabi Sharia law since 2009 in the northeast of Nigeria. It gained control of large swathes of territory in 2014 before being pushed back by Nigerian troops and forces from neighbouring countries. About 2.1 million people have been displaced and thousands have been killed. This entry was posted in AFRICA and tagged Africa, IMN, Islamic Movement of Nigeria, Kaduna, Kano, Nigeria, shia. Bookmark the permalink.